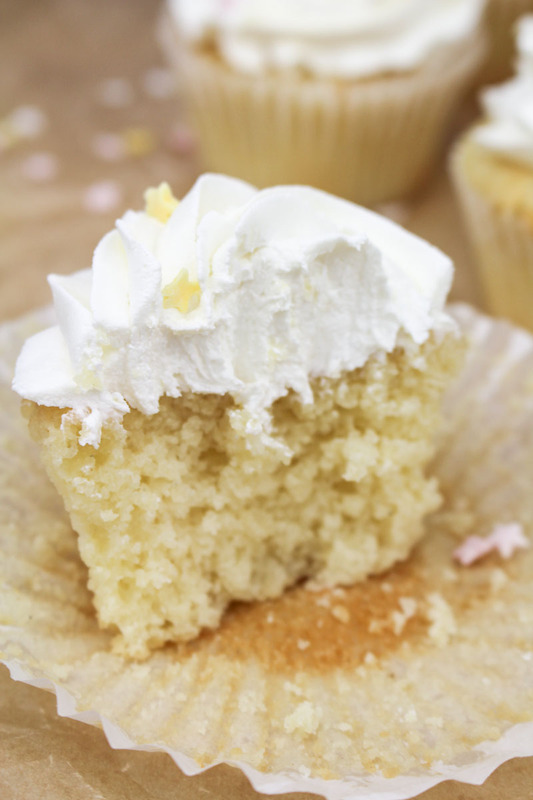 Yesterday I shared with you all my tips an tricks for how to get your vanilla buttercream the absolute whitest, but now you need something just as white (well, almost) to pipe it on to, am I right? Well, how about my white vanilla cupcakes. This is my new absolute favourite cupcake recipe that inspired last week’s coconut lime cupcakes, and some incredible Eton Mess cupcakes that are heading your way next week. 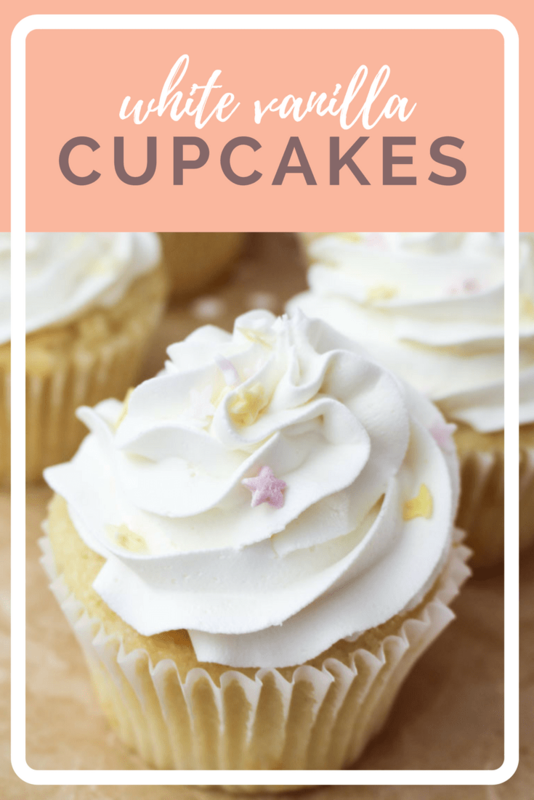 It’s the foolproof cupcake recipe that every baker needs in their arsenal, and I’ve worked out all the tricks to getting these cupcakes as white as humanly possible – without compromising on taste, of course. I’m sure you’ll agree they look pretty gorgeous ? Let’s start with the batter. No one wants a dry cupcake, so my white vanilla cupcake recipe includes half a cup of yogurt to add some all important moisture. Vanilla yogurt is the best here, as we are trying to get that vanilla flavour without adding anything colourful. You will definitely be able to taste whatever yogurt you put in here, so now is not the time to add something with a strong flavour. Get down to the supermarket and grab some good quality vanilla yogurt, and you won’t regret it. The vanilla in the yogurt means less vanilla extract is needed, which is great when you’re trying to avoid adding colour. If you’re committed to the white, then you’re going to want to add clear vanilla extract to your batter and your buttercream. To be honest, half a teaspoon of brown vanilla extract isn’t going to colour your cupcake batter much at all, but it will be super noticeable in the frosting. And yes, we all know that clear vanilla extract doesn’t taste as yummy as the brown one, so if you don’t care about keeping things white (or you don’t want to buy a bottle of extract you’re never going to use again) then just use the good stuff. No white cake batter is complete without egg whites, and we’ve got three in here. Normally I would use whole eggs for cupcakes, but the whites alone were perfect here. I don’t know about you, but I always find getting the egg whites to mix in with the creamed butter a little tricky – stick with it, and don’t worry if the batter looks a little slimy. Once you add in the flour, you’ll be good to go. If you’re a seasoned cupcake maker, you might notice that the baking temperature is a little low in the recipe below. No, I’ve not lost my mind. 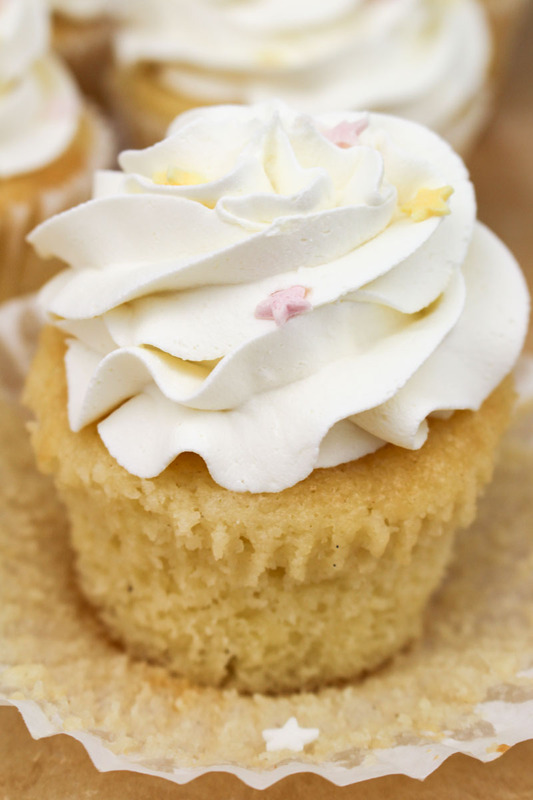 The key to keeping your fluffy little cupcakes white is to bake them for longer at a much lower temperature. I found that baking them at 130°C in my fan oven for 25 minutes meant they were perfect. Just be careful they don’t start to brown at the edges! The cupcake tray might need turning about 20 minutes in, just to be sure. The baked cupcakes are going to look like the ones above, and you might be a little concerned that they aren’t quite ready. Make sure to stick a toothpick or metal skewer (I use a knitting needle) into the middle of one of them, and if it comes out without any batter or crumbs on, then they’re done. I like to leave them to cool in the cupcake tray (on a wire rack) for five or ten minutes, and then take them out to finish cooling completely. Icing whitener is surprisingly effective! Trex makes buttercream taste bad – use at your own risk ? I always used to hate frosting cupcakes. It was the worst bit of the whole baking experience (apart from the washing up, obvs). But now that I’ve perfected the whippiest, fluffiest, scrummiest buttercream going, I genuinely love it. My buttercream is so easy to pipe, and is really fun to get creative with. So if you hate buttercream too, I urge you to give this a go and see what real buttercream is supposed to feel like – nothing like that hard stuff you’re used to. 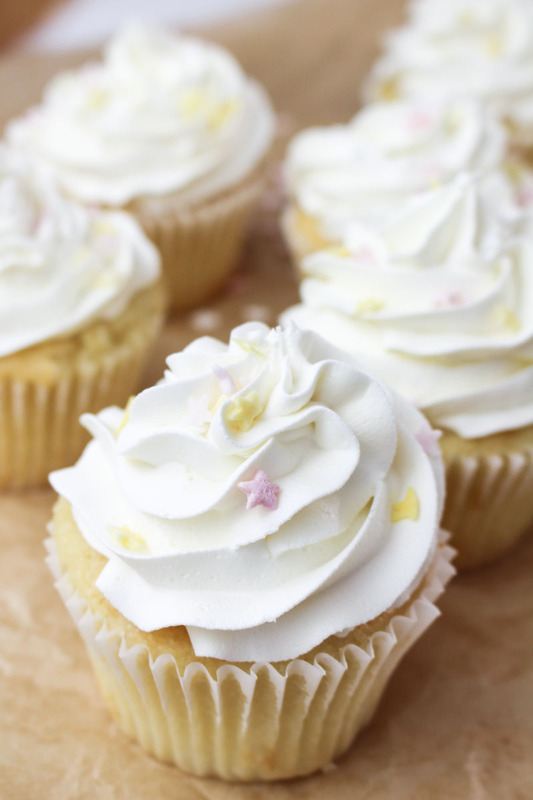 Soft and moist white vanilla cupcakes, topped with the fluffiest white vanilla buttercream around. 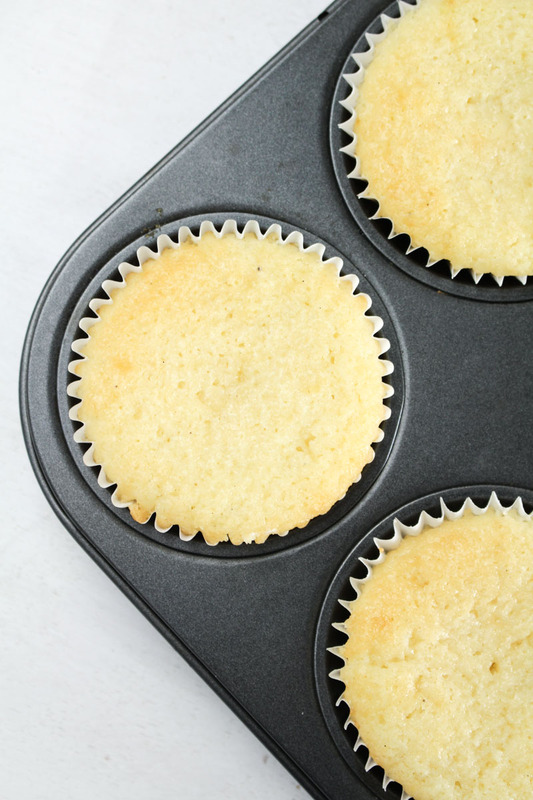 Preheat the oven to 150°C / 300°F (130°C fan) and line a 12-hole muffin tin with cupcake cases or liners. Place the butter in the bowl of your stand mixer (or a medium sized bowl if using an electric hand mixer) and beat for a minute or so until light and creamy. Add the sugar and beat well for at least a minute, scraping down the sides if needed. Add the egg whites, one at a time, beating well between each addition, until all the egg whites have been incorporated into the butter. The batter may look a bit slimy, but that's okay. Add the vanilla extract, milk, and yogurt to the bowl and beat well for a minute or two, scraping around the sides of the bowl to make sure the batter is well mixed. Add the flour, cornflour, baking powder, bicarbonate of soda, and salt and fold together on a low speed until well combined. Spoon the batter into the cupcake cases, filling about two thirds full. Bake in the preheated oven for 20-25 minutes, until springy on top and a toothpick inserted into the middle of the cupcakes comes out clean, without any crumbs on. They will look under baked, but that's fine. Leave the cupcakes in the tray to cool for five minutes, and then remove and place on a wire rack to cool completely. Add the sifted icing sugar in three or four stages, beating for at least a minute in between additions. Once all the icing sugar has been beaten in, add between 2 and 4 tablespoons of milk or cream (depending on what consistency you need your frosting to be), as well as the vanilla extract and icing whitener (if using), and mix well again. 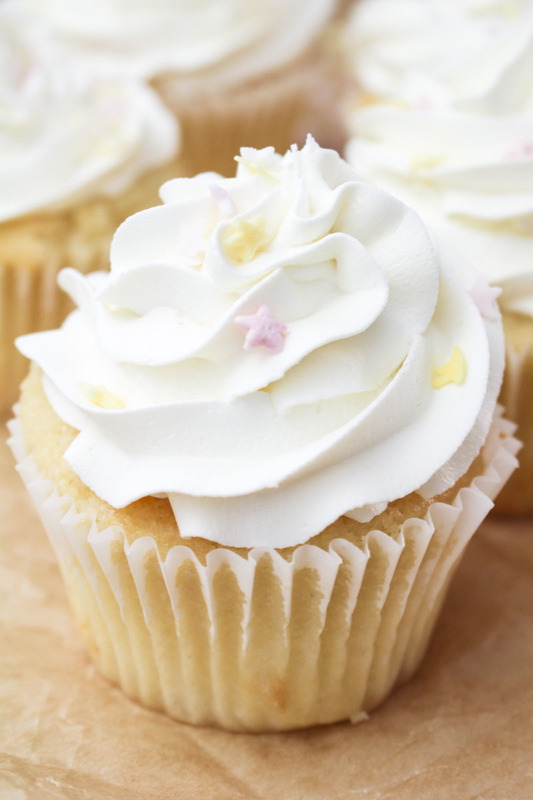 Place a large star tip into a piping bag, and pipe the buttercream on to the top of the cold cupcakes. I do think that this is a super effective cupcake base. Everything you’ve baked with it has turned out delicious. It’s a bit boring by itself but in the Eton Mess cuppy Cs for example, it was perfect. Yes, but I wouldn’t add any extra salt to the recipe if using salted butter ?